If you are trying to put all your contacts in one place for a specific event or want to keep track of all the contact, the use of phone list is recommended. The phone list is a document which enlists all the people in your contact as well as their phone numbers. Almost every business and individual, use the phone list for professional and personal use. This list of contacts can be a very useful and handy tool for you if you want to contact a specific person among your hundreds of contacts. You can easily search for a specific contact in your contact list if you have organized your contacts in the list smoothly. The contacts can be sorted in the phone list by first name, last name or by address. Not only phone number, the phone list also has enough space for you to provide the email address, physical address and other types of address also. If any of your contacts have more than one contact number, you can save them with the same name at the same place. 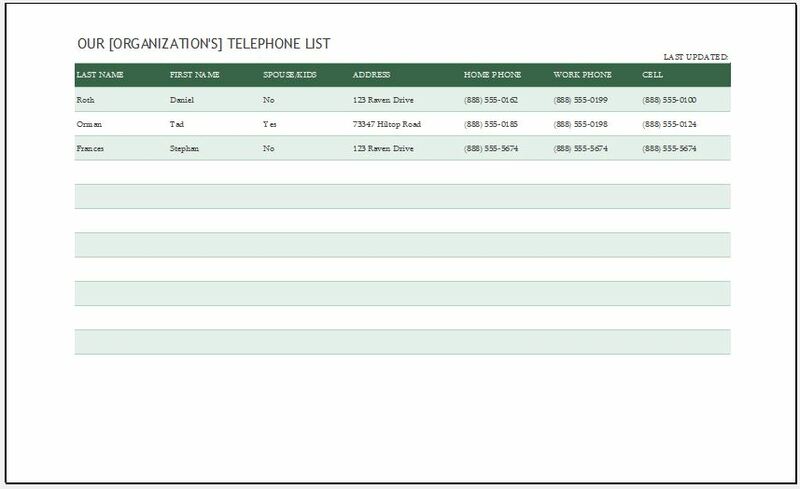 A phone list template is a simple and easy to use tool for enlisting all the contacts so that they can be retrieved easily when needed. The use of a template for your business can be a quick start since it saves a lot of time and saves you from getting into a lot of formalities. The template allows you to sort your contacts in any sequence you want. After the list has been sorted, it is ready to be printed. You can convert this phone list into email address list, physical address list etc. through the easily customizable features of the template. Add as many columns and rows in the list as you want.